While exploring the DeChambeau Ranch near Lee Vining, I came around the corner of the house and saw this design on the old wrap around porch. 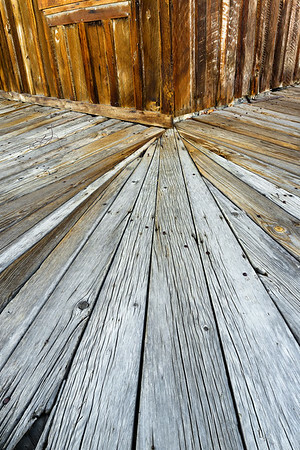 I really liked the lines and textures of the old, sun-baked boards. The difficulty was getting my camera between the two posts at the corner of the porch in such a way as to get as much of the boards as possible. I also had to do some focus stacking because of the wonky angles.